Academics are the primary area of thrust at Father LeBlond School. 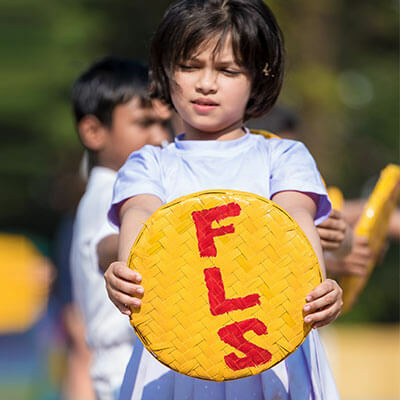 The systems built up and implemented for effective academic administration make FLS a conducive environment for the young minds to explore, learn and get enriched. The School keeps highly qualified, experienced and skilled teachers for imparting quality education to its students. In order to maintain the high standard of academics the School maintains a world-class teacher-student ratio of 1:6 so that each student is given individual care and attention. Weak students are given special attention and guidance through regular Extra Coaching Classes in order to improve their grades. Class Rooms are well equipped with modern day teaching methods using latest technology. All the Classrooms have the latest Smart Class System installed for modern day teaching. The School Mobile Application provides each parent with his or her child’s academic information like Homework, Attendance, Teacher’s comments, etc. The academic progress of a student throughout the session(including examination results) can be monitored through this application, by both, the teacher and the parent. For smooth monitoring, the School has been divided into two wings: Junior Wing (Classes I – V) and Senior Wing (Classes VI – XII). Respective heads are responsible to look after the Academic Development of the students in their wings. The Academic Year has been divided into two semesters, from April to October and from November to March. Curriculum as per ICSE & ISC norms is followed. During the first semester one Unit Test and the Half Yearly Examination is conducted and during the second semester another Unit Test and the End of Term Examination is conducted. In addition to the Unit Tests and End of Term Examinations (Half-Yearly and Annual Examination) the school also conducts Continuous Assessment Tests (CAT – three times a week) throughout the academic year. The promotion of a student does not depend on the result of the End of Term Examination only. Promotion of a pupil is decided on the basis of a Continuous Evaluation System that takes into account her/his performance in the CAT, Unit Tests, Half-Yearly Examination and Annual Examination.